Last week, Gideons and Auxiliary hosted the 2016 Uganda International Scripture Blitz in the cities of Hoima and Masindi. Thousands of students now have their own copy of God’s Word they can take home to their families. There are so many testimonies from people placing their faith in Christ after having a Scripture placed in their hand. However, it’s the small encounters that provide big results. One person Gideons met last week was Flora. She runs a small cafe in a rural area outside of Hoima. Several Gideons stopped there for bottled water after driving on the dusty roads to the next Scripture distribution. They began talking to Flora about what they were doing. They presented her with a New Testament and showed her the “helps” section and the plan of salvation in it. The conversation came to the point they asked Flora if she would like to receive Jesus as her Lord and Savior. “Yes, I would,” she replied. One of the Gideons led Flora in a prayer to ask Jesus into her heart. They rejoiced that they only needed bottled water, but the Lord arranged it so they could offer Flora living water, that she may never thirst again. Thank God for dry, dusty roads. We also thank God for the many more testimonies we will share with you from this recent Scripture blitz. Keep watching for more news and testimonies from the Uganda International Scripture Blitz. You can play a part in this life-changing ministry by becoming a Friend of Gideons or donating to The Gideons International today. Praise the Lord that, as He said in Romans 8:28 And we know that all things work together for good to them that love God…., when He says all, He means all. Even the dry and dusty roads can be used to reach the lost. Thank you Uganda team for your sacrifice of time and resources, and especially for helping Flora (and others) to join the family. PTL. Keep up the good work and reach out for the many souls out there. MAY THE ALMIGHTY GOD BLESS YOU N YOUR FAMILIES. No matter how bad a situation is – our God is awesome and in the business to make all things new. How I praise and thank Him for the Gideons – for their perseverance in bringing His Word through every door He opens!!! Thank You Jesus!!! Gloria a Dios.., cada dia son mas personas que conocen de Jesús por medio del trabajo de la siembre de la palabra que junto hacemos. 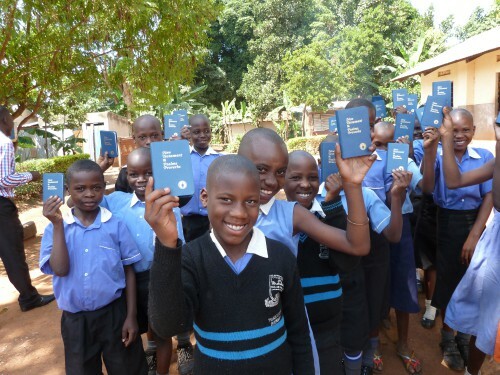 So thankful for the Gideons in Uganda and from outside Uganda who brought the gospel to these wonderful people of Uganda; let’s keep praying for these people and hope they continue to seek the LORD. Not sure the person that led men of God such as Billy Graham to the LORD; how many seeds would be in that apple! So numbers do not alway matter; it is the heart that the LORD sees. As President of the Lower Columbia Gideon’s I’d like to request that the new Daily Prayer you include (in the front of it) several pages with a yearly monthy calendar that our members could put important dates to carry around with them every day and that way we all will have a daily prayer and Bible reading list available at all times. Also, have the calendar start with the month of June thru May to match our yearly schedule.